I went directly to the church and found the one monk, wooden semantron in hand, ready to start banging out the call to prayer. A few minutes later and the bells began their bone-rattling toll. The relic of St John the Baptist was made available again for veneration. 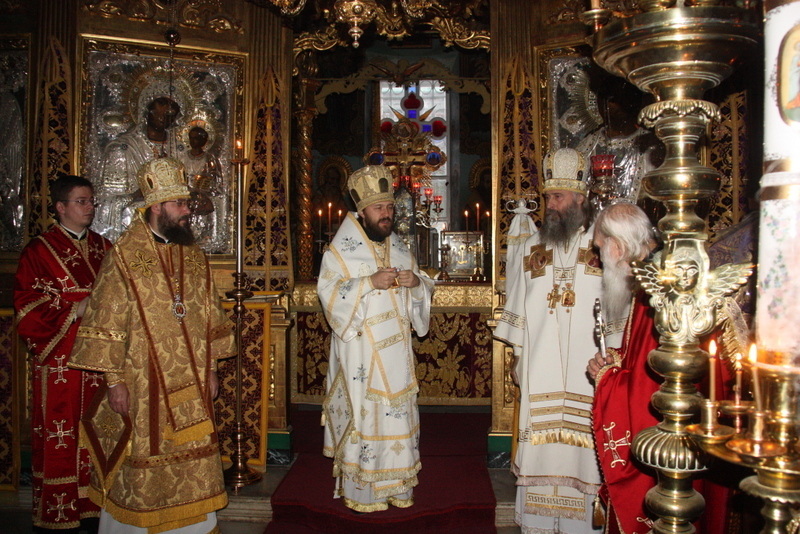 Full hierarchical Liturgy proceeded flawlessly, the singing was magnificent, I received Communion at the altar with the other Priests, and life was good. Lunch was a formal affair, with the monks following the clergy in procession to the refectory. Having entered the altar at Liturgy, I was now indisputably and publicly kosher, and one of the monks grabbed me and pulled me into the ranks of the brotherhood walking in procession. I was accepted as one of their own, and it felt good to be “in”. After lunch, procession back into the church for final blessing and dismissal, I was taken to Fr Asterik, who promised to allow me to venerate the relic of St Silouan the Athonite. I had been waiting in the church, but I found out the relics were not stored there. They were in their own separate chapel. 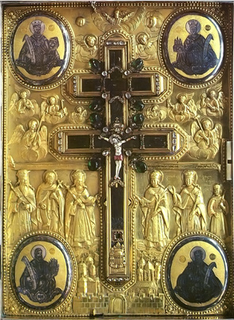 What I saw there took my breath away: two long glass cases filled with reliquaries: large relics of St John the Theologian; the Three Holy Hierarchs; SS Seraphim of Sarov; the wonderworking Unmercenary Physicians Cyrus and John (their whole skulls); all the Apostles; the True Cross; several New Martyrs I didn’t know; St John the Baptist back in his usual place; many, many more that I can’t even remember; and in one corner, on a table by itself, in a large, round silver reliquary, the skull of St Silouan the Athonite. Fr Asterik graciously left me alone in the chapel for a few minutes to pay my respects to the Saints and to pray. A great big, final Amen to the whole visit to Mount Athos. Since I had an hour or so before the ferry boat came around to St Panteleimon’s, I went back to the guest house to check out and found Fr Filadelf puttering around in his tea room. There was tea, to be sure, but it being the heat of the day, Russians don’t drink hot tea, but prefer kvass, which he makes from leftover tea that he sort of ferments in a big vat that has a large, stinking mass of some kind of yeast or fungus floating on the top of it. I got detailed lessons in the homemade production of kvass, the difference between the Russian and Jerusalem productions, and the generous offer of my very own jar of stinking yeast/fungus to bring home with me to start my own production (like I was going to get that through customs without charges of biological warfare). We sampled both the Russian- and Jerusalem-recipe kvass (it’s made from rice and lemon instead of tea and sugar), and I have to say, it grows on you (as well as in the vat). There was also a little rose-flavored loukoumi (Turkish Delight) to go with. Finally, it was time to leave. The ferry boat made the return trip from the Port of Daphne, and we put in at all the same monasteries on the way back. I stood on the top deck again, this time with a pair of men I had met on the path while hiking to Xenophontos. Come to find out, they were both Polish Catholics (gasp! ), one a Carmelite who had studied Scripture at the Pontifical Biblical Institute, and the other, a newly-minted diocesan Priest who had just finished his Ph.D. at the Institute Biblique in Jerusalem. They had been tracing St Paul’s missionary journeys and undertook a side-trip to Athos while visiting the latter-day Thessalonians. We had fabulous conversation. The bus ride back to Thessalonica was long, hot, and uneventful. In the city, I transferred buses and saw that the temperature was 43 C, which is somewhere over 100 degrees; no wonder it was sweltering in the bus. I made it back to the hotel, had dinner without incident, took a long, exquisite shower, posted a few blog posts to the blog site, and went to bed. 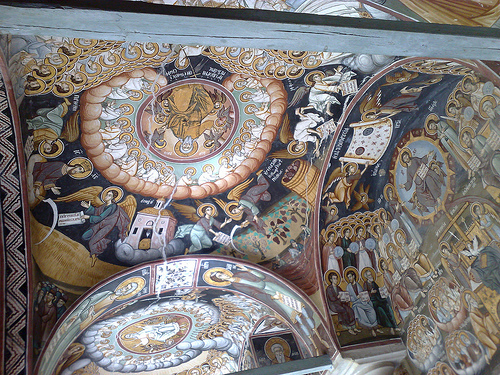 I went on-line today and found a few good pictures of Xeropotamou and St Panteleimon, of things I did not get pictures of, and to illustrate some of the things I’ve talked about in recent posts. These are not pictures I took on my own trip, but they do supplement what I’ve posted. 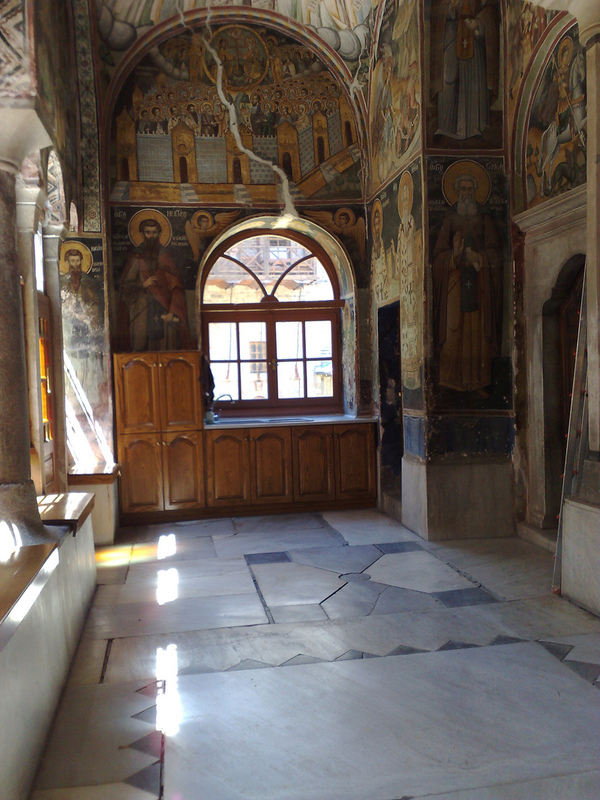 First, here are a few pictures of the narthex of the Catholicon at Xeropotamou. The frescoes are of scenes from the Apocalypse/Book of Revelation. 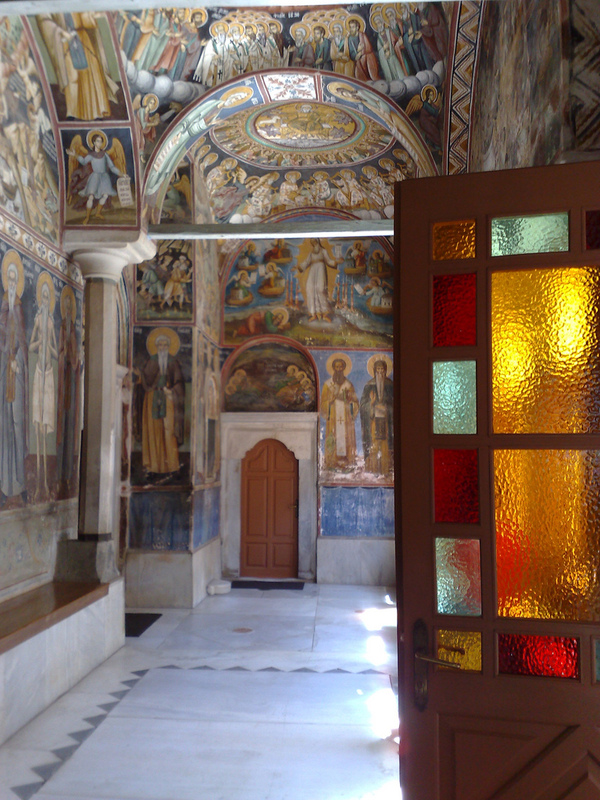 Narthex of Catholicon at Xeropotamou. I hope these help to flesh out a bit more the descriptions I gave previously. [Wednesday, 6 July 2011] Today is my 26th anniversary, and it is the first time Annette and I have not been together for it. The bell ringer in the guest house seemed to ring his bell with extra zeal this morning. He is a tall, thin Russian monk, with long black beard and hollow cheeks. “It is time to pray, it is the hour of prayer. O Lord Jesus Christ, our God, have mercy on us,” he would cry intermittently. I couldn’t move. Standing in church several hours a day and walking around the side of the mountain have made my feet and ankles swollen, and they hurt. The night had been warm and muggy; I don’t think I slept well, either. I didn’t look forward to going to church. The services were a blur; I spent all my time trying to stay awake and focus. I noted that, here and there, a few of the monks had nodded off to sleep. It is the tail end of the Apostle’s Fast on the Old Calendar. I think between the heat and the fasting, everyone is about done in. It being a Wednesday in a fast, there is only one meal in the refectory today, and that is at 5 pm. However, the monks are compassionate on the poor palomniki (pilgrims), and the tea room in the guest house was open, with two large pots of strong tea, a samovar full of hot water to dilute the tea, bread and jam waiting for us. God bless Fr Filadelf. I ate and went back to bed and slept for two hours. Everybody here must sleep in snatches of a few hours. I’m probably ruined for life: eight straight hours of sleep seems like a distant dream. I don’t think I’ve had one since I left home. Random notes: Different customs in different villages lead to misunderstandings. At the end of Liturgy yesterday morning, two trays of antidoron bread had been set out for us. After venerating the Cross which the Abbot, Archbishop Sergei, held, I went and took a small piece from one of the trays and went back to my stall to see if, in fact, the services were over and it was time to go out. It was, and I went out. Later, Fr Zadok told me that some of the monks had noted I had not taken any antidoron and were wondering if the reason was because I was Catholic or something else. Come to find out, the first tray held the actual antidoron, the second tray held extra bread that had been cut up. I had taken a piece from the second tray only. I remembered seeing some of the monks take from both trays but thought nothing of it. This morning I very deliberately took bread from both trays and thus confirmed, to the eagle eyes of the monks that watched for that sort of thing, that I am, indeed, an Orthodox Christian. It wasn’t lemonade they poured into my cup at lunchtime; it was kvass. I wouldn’t go out of my way for it, but it ain’t bad. There were boys as young as six or seven with their fathers at lunch today. I want to describe the rest of today in a separate post. The choirs are stupendous. I’ve always loved male choruses, but these men are outstanding, and it’s clear that the singers take pride in their work and satisfaction in praising God well. At Xeropotamou it was possible to fall asleep during Matins because they chanted solo and so quietly in the dark that it could put you to sleep. At St P’s, I have been put in a stall in the left choir, near the left reader’s stand, and with the reader reading loudly (the church is very big), and two 8-voice male choruses singing hymns, sleep is simply impossible. I’m pleased to note that they sing many of the same settings that we sing at St Innocent’s and that I’ve heard in other churches in America. They didn’t seem to mind that I sang along quietly. Fr Zadok, the right choir master, was American before coming to St Panteleimon’s to become a monk, so he speaks English. He’s been a great help. The walk to Xenophontos was a bust. The “30-minute walk” turned into the better part of an hour, and the day is very hot; I wouldn’t be surprised if it topped 100. It was well that I brought water with me. There was a store, but it wouldn’t be open again until the evening, and Fr Ieremias, to whom I had brought greetings from Fr Andrew in Essex, was nowhere to be found. I took a few picture of the place—it’s a lovely enclosure, more compact that Xeropotamou—and headed back. Along the way, near a part of the road where there were many curves, I received a blessing (miracle?). I suddenly caught the fragrance of incense in the air, like frankincense only sweeter, three or four full breaths of it, and then a very cool breeze blew down on me for a few seconds, and I was completely refreshed and bore the heat of the trip back to St Panteleimon’s without any discomfort at all. I asked the Archondaris, Fr Vitaly, if there were any sketes (small brotherhoods) or hermitages near there, and he said there were none between the two monasteries, so I can’t account for the incense except by God’s grace. I should thank someone, but I’m not sure whom to thank. Panagia? 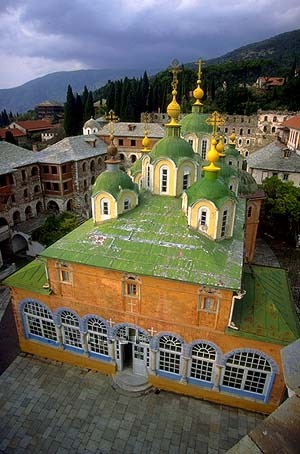 St Panteleimon? St Silouan? I’ll just thank everybody the next time I’m in church. Since my clothes were drenched with sweat when I got back, I peeled out of them and took a shower. The ferry boat had just deposited several pilgrims, so the Archondaris had opened the tea room and Fr Filadelf, who tends it, made tea. I sat with the group of Russians (none spoke of lick of English, and me without a Berlitz phrase book), ate rose-flavored loukoumi (Turkish Delight), and drank my tea. I also asked Fr Vitaly about St Silouan. His English didn’t extend to a good enough description, so he handed me off to Fr Filadelf, whose English is better. After dinner tonight he said he would find me and will take me to the mill, where St Silouan worked and where he had his revelation/vision of the risen Christ that transformed his life. I also learned that the monastery has his skull as a great relic, but that I must ask Fr Asterik in the church about venerating it, because it and the other relics are not always made available for veneration. After Vespers, a young seminarian from St Petersburg and I went with Fr Filadelf up to a few old buildings to the west of the monastery, where in years gone by, the monastery ground its wheat with a water-powered mill. St Silouan worked in the mill as his obedience, and there is a small chapel dedicated to Prophet Elijah there. It was in this chapel that the living Christ appeared out of the Icon in the Iconostasis and changed St Silouan’s life. The chapel was opened for us and we were allowed to venerate the very Icon and to pray. A storage room opposite this chapel has since been turned into a new chapel dedicated to St Silouan, so we also went in there, the two Russians sang his Troparion in Slavonic, and we talked a bit about his life before heading back. [Monday, 4 July 2011] Its Independence Day at home, and I think I am the furthest from home that I’ve ever been in my life. No, I’m wrong; it was when I was in Moldavia & Bukovina in 1999; they’re further East. Just as I was lying down to sleep last night, it rained for a while. At 2:30 the wind woke me up howling around the building; alas, I didn’t get back to sleep before the bells rang at 3:15 for services. During that time, I imagined all kinds of horrible weather waiting for me in the morning, when I was to walk to St Panteleimon’s: heavy rain to soak me, gusts of wind to turn my umbrella inside out and blow me off the foot path into a gorge, that sort of thing. But, when I stepped out of the guest house under the night sky and saw the Milky Way overhead, as I did every morning I have been here, and the gusts of wind gone, and the temperature down several degrees from what it had been; it was, in short, perfect hiking weather. Thank God for His mercy. I committed another gaffe at Liturgy this morning: I tried to go into the altar for Communion and was refused. It seems nobody but the celebrating Priest receives Communion on weekdays (unless it’s a feast? ), even though they serve the Liturgy daily. In other matters, note to self: be sure to ask for everything you need and you won’t have to improvise in the future. Case in point: while I was washing my hair in the sink this morning, the only other guest in the house pointed out that the last toilet stall up in the third floor restroom was, in fact, a shower. And, behold, it was so. And it had hot water, and soap, and shampoo, and lots of lather, and I stepped out it feeling human again. I suppose all the monks had gone back to bed, because the place was all locked up again after my shower, but one of the workmen pointed me to the back gate, which was unlocked, so I went out a different way than I came it. I left a little after 8 am, in order to avoid the heat of the day catching up with me. At the end of the road that leads to the monastery, where it joins the main road the buses use, I found a small bus stop. Near it was a footpath (England does not have a monopoly on them), and a few yards down the path, half hidden by shrubs, was the sign I was looking for: St Panteleimon’s, Xenophontos, and most points west, this-a-way, so off I went. The path was, for the most part, paved with rocks, very much like the trails in our national parks are, so you have to watch where you step, but the way is clear and fairly easy to travel. It took me a little longer than 30 minutes to get to St Panteleimon’s because I stopped to admire the view of the sea and to take pictures. I arrived at St Panteleimon’s around 9, and the Archontaris (Guest master) told me that the office for receiving pilgrims would not open until noon, so I sat on the back porch, read my Bible, worked my prayer rope, and talked, in broken Greek, with Methodios of Bulgaria, an old man who is suffering from poorly treated heart trouble, and asks your prayers (that’s your cue to Cross yourself and say a prayer for him). On registration, there was no problem with me staying three days (two days beyond what my diamonitirion/permit allowed). The Archontaris got me a key, a stack of linens, and took me to my room. … sorry. That was the bell for lunch, and I had to go. Lunch was more of what I had been expecting from a monastic trapeza, but bigger, like everything else around here. (At its height in the 19th century, there were 2,000 monks at this monastery.) There are about 60 monks at St Panteleimon’s now, and a great many construction workers (there are vast building and renovation projects going on everywhere), so there were many mouths to feed. The hall itself is huge, with very high ceilings, all of it completely frescoed with saints and murals (including really big ones of the Last Judgment and another of a soul passing through the “toll-houses” [if you don’t know, don’t ask]). The Abbot, or a visiting Archbishop, sat at the head table, and the rest of us on four long tables with benches on either side. Being a priest, I was put near the head table. Maybe I sat with other priests; it’s hard to tell around here because Athonite tradition has it that only the Abbot of the monastery wears a Cross, so priests, deacons and monks pretty much look the same . Mostly the monks sat together, and mostly the laymen sat together, but there is an easy mingling. There is good humor among the monks before the meal; lots of pleasant, quiet chatter; and very great respect, deference and care for the elderly monks. Lunch consisted of good potato soup, white and (good Russian) black bread, raw scallions, stewed veggies, and kashka (I don’t like kashka; it tastes like sweat), lemonade to drink, and fresh apricots for dessert. A monk read from the lives of the Saints while we ate. I looked in their monastery store and, if you know Fr Alexander’s shop in Hiram, even Fr Alexander would gasp in amazement at what’s here. Pity the exchange rate is so lousy for the dollar right now, because it nearly doubles the price of everything in the euro-zone. I shall have to be very selective in what I buy. I’ll draw up some comparisons between the two monasteries, based on my brief experience at both. 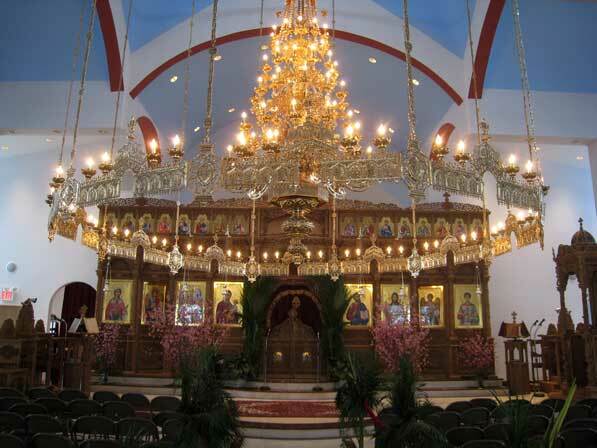 (X) is Xeropotamou; (SP) St Panteleimon’s. Both are under repair/renovation. There is money coming from somewhere; lots of it. I suspect that, in the case of SP, the Church of Russia is presenting something of a showcase or making a political statement here. I was told later that a lot of the money comes from the European Union, from some preservation of historical monuments fund. Tale is that the second largest bell in the world is here at SP, and that it is rung once a day. Both monasteries have a good mix of both old and young monks, so adequate vocations don’t seem to be an issue. I have often thought Russian piety is warmer than Greek piety, and I’m discovering it to be so, both among the monks and the laity. (X) refused Pavel the Slovenian alcoholic-turned-pilgrim a night’s stay; (SP) allowed him to stay the night. (X) My impression is that the rules here are rather strict. My few contacts with any of the monks, including Fr Petros the guest-master, were very brief and I got the impression that they’d like to be done with me as soon as possible, not that I was disliked, but rather that interaction is best kept to a minimum. I never saw most of the brotherhood except in church. In that context, the monks spoke to one another only at immediate need and rarely even made eye contact. They were engaged in constant mental prayer and respected everyone else’s freedom and silence and left them alone; knowing what their life is about, I can respect that. (SP) So far I have seen the kind of casual interaction between monks and visitors that I’ve seen in some monasteries in America, as well as in Essex: yes, the monks have their work to do, but they’ll talk to you if you happen by. The monks greet one another casually in church, ask blessings from this priest or that, and are warm with pilgrims they know. The choir members snicker among themselves over their own mistakes and exchange knowing glances when the other choir gaffes. Also, the monks are working cheek to jowl with the lay construction workers on several projects so many of them are outside and they all interact freely. (X) Guest house: very new renovation, like a resort in the quality of the construction and the materials used: slate floors, decorative tile everywhere, lattice-work in most of the ceilings, high quality doors and windows, good color schemes and decoration, quality furniture in the public rooms, new stainless steel kitchen in the guest house, etc. Only one shower in the whole place. (SP) Guest house: probably 19th century construction, painted wooden floors, ad hoc renovations in the past (e.g., there used to be coal furnace heat for each room, now there is a radiator; also, the restrooms & showers (yes, there are showers here, and even mirrors!) are at the end of the building, and you have to go out onto the porch to get to them; must be awful in the wintertime. The renovation will doubtless make everything modern. (X) had only one icon on the wall for decoration, an inadequate wall light, and a desk lamp plugged into the one electrical outlet. (SP) has a big wooden reading stand in front of 10 icons on the wall, clearly meant for devotional use, an inadequate wall light, one badly placed electrical outlet, and a small kerosene lamp and box of matches(!) for additional light at night. I also discovered that the electricity is turned off after Compline, when it’s dark, just when you need light the most (thankfully, I took advice and brought a flashlight so that I could find, and light, my kerosene lamp). (X) Schedule. 3:30 am Midnight office, Matins, 1st Hour, Liturgy; breakfast for pilgrims. (SP) Schedule: 4:00 am Midnight office, Matins, 1st, 3rd, 6th Hour, Liturgy; lunch. 6:00 pm Vespers; late dinner for pilgrims. 9:00 pm Compline & Akathist. (X) good Greek fasting food. (SP) good Russian fasting food. All the monks seem to eat well. (SP) seems to have gotten around or ignored the Athonite rule about “beardless youths” being on the Mountain. The rule is that you have to be at least 18 years old to be on the Mountain, but there are boys as young as 12 or 13 here with their fathers. Here are a series of pictures I took on the footpath from Xeropotamou to St Panteleimon’s. From reading accounts of monks walking from monastery to monastery on the Holy Mountain, I had an idea of what it was like there. I was wrong. One of the pilgrims on the boat to Athos told me that the Athonite peninsula is exceptionally green, given the surrounding country of the Chalkidiki part of Greece, and that there are a lot of natural springs and creeks to be found. At any rate, if you like nature scenery, look over the pictures. If you don’t, you can probably skip this post. A set of pictures of the ferry boat trip to Mt Athos. The second trip on my sabbatical is the one I had wanted to do first: visit St John the Baptist Monastery in Tolleshunt Knights by Maldon, in Essex, England, and then on to Mount Athos. The main reason for going to St John’s was to visit with Fr Zacharias (Zachariou), who is the spiritual father of the monastery, and who is fairly well-known in the states for his three books on spiritual life. Fr Zacharias was a disciple of Elder Sophrony (Sakharov), of blessed memory, who was, in turn, the disciple of St Silouan of Mt Athos. 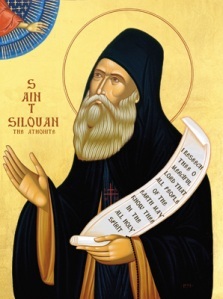 (A few of the books by Elder Sophrony, including his biography and edition of the writings of St Silouan, can be found here.) I had written to the monastery last November, and Fr Zacharias has agreed to receive me, but he was out of the country until June, so I rearranged my schedule to be sure we would have time together. I will be 8 days at the monastery. This monastery has some unique features. In the first place, it is a mixed monastery having both men and women monastics in it, some forty monks, all told, I understand. Some of the nuns have good reputations their spiritual maturity, and I hope to have some conversations with them, as well. In addition, because of the peculiar circumstances of Elder Sophrony’s life (he lived in a nursing home in France as an invalid for several years and began his monastic community there), St John’s does not keep the usual monastic typikon of the daily cycle of services. Instead, they gather every morning and evening for 2-hour sessions of saying the Jesus Prayer in common, and they celebrate the Divine Liturgy several days a week. While I look forward to the Liturgy, frankly the thought of sitting still for four hours a day in contemplative prayer strikes me as, well, probably beyond my means. We shall see. I didn’t plan these trips with ease in mind, and this is certainly going to be a challenge. By your prayers, I’ll be up to it. After 8 days at St John’s, I will be flying to Thessaloniki, then making my way to Ouranoupolis, which is the port from which one embarks to Mt Athos, the Holy Mountain. The trip to Mt Athos is the fuzziest part of my sabbatical. As of this date, I have not yet heard back from the Pilgrim’s Office saying that I can actually have a pass onto the Holy Mountain on the dates I have to travel there, nor have I received word from the two monasteries I want to visit, saying they have reserved a place for me to lay my head. I suppose I’m going to have to break down and call, hoping (against hope) that somebody on the other end will speak English or French, ’cause my demotic Greek is pretty lame. But, alas, as I say, I have not yet finalized the plans to visit anyplace on Mt Athos. This bums me, as I like to have all my plans place well ahead of time so that I only have to deal with the spontaneous issues and grief that will no doubt arise, and not worry over things like reservations. But I’m hopeful. One day this week I suspect I’ll have to get on the phone at 6 am and make phone calls to Greece and hope we are able to communicate about my plans. If only they had answered letters and faxes none of this would be necessary. But who said pilgrimage was easy?